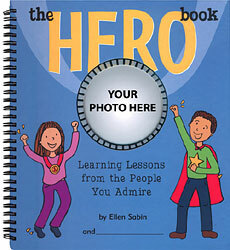 THE HERO BOOK ~ Learning Lessons from the People You Admire is a refreshing, engaging and empowering book that helps children identify the qualities and characteristics they admire in others while also encouraging them to emulate these traits in their own lives. The 64-page, spiral-bound, hardcover book offers inspiring narrative, fun activities, and great conversation-starters that will take children on a journey to find their role models and discover the hero inside themselves. Helping children think about what makes their heroes special or admirable. Encouraging children to seek out positive role models whose example will provide encouragement and empowerment. Strengthening childrens self-esteem by showing them all the admirable qualities they possess. Inspiring children to emulate the traits and actions they admire in others. Our cultures obsession with celebrity and wealth can create an environment where children are choosing their heroes or role models based on status or power. The Hero Book not only lets children discover why they admire certain people, but also encourages them to identify new heroes based on the characteristics they think are important and find inspiring. The book teaches children that they have the power to take certain qualities of their role models and emulate these traits in their daily lives  whether its someone they know or someone they have read about or seen on television. As the parents and friends of children, it is critical that we help our children find positive heroes who will empower them to be their best. It is also important that we allow children to celebrate their own positive qualities so they can grow-up with character and confidence. Click here to view sample pages and preview The Hero Book. Click here to download sample pages of The Hero Book in PDF format (805 KB). Click here to Order The Hero Book Now! Learn about a fun and exciting author visit and reading event at your school. View our free guides that help teachers, parents, and religious educators maximize the impact of this book. To receive an email announcing the next book in our series, click here.